One thing I have discovered working with families to find their perfect fit on the island is that there are many different ways to live on Bainbridge Island. Hearing some first hand accounts . . . in their own words . . . about why folks moved here and why they chose to live WHERE they live may help you in your search on Bainbridge Island. Below is a sampling of a few popular areas on the island . . . there are indeed more. To research other areas check out the Neighborhoods Page. Although we wanted to feel “worlds away” by living on an island, we also wanted the practicality of being able to walk to the ferry, to school, and into town. Our neighborhood offers a respite from fast-paced city life, but is also convenient to Winslow. As soon as we knew we wanted to move to Bainbridge, we knew we wanted to work with Jen. We found her through her informative and entertaining blog and her service was top-notch at every step of the process. She is not only incredibly knowledgable about the market, but she is able to intuit a client’s needs. Her attention to detail allowed both of us to relax and know that she would be taking care of everything…before we even thought of it. To top it off, she did much of this long-distance and helped us make our move from Chicago to Bainbridge the enjoyable process that it should be! We moved to Bainbridge Island from Chicago in the Spring of 2010. Having lived in an urban environment for over fifteen years (New York, Washington DC, Chicago), we were ready for a change. Neither of us wanted to live in a “suburb,” but instead hoped to find a small caring community that would allow our then two-year old daughter to grow up playing in nature, not in a concrete jungle. We were delighted to find exactly the kind of community we sought just a short ferry trip from downtown Seattle. Each day, we still find new reasons to love our island community. The North Town Woods Neighborhood. We were moving to Bainbridge after living IN the city for 8 years. Bainbridge has lots of beautiful and remote homes and we were a little romanced by them at first but then we realized that our favorite part of our old neighborhood was that we could walk everywhere and there was a true sense of community. So suddenly sidewalks were really important! We also wanted our kids to be able to walk to school and North Town Woods could not be more ideally situated. From our house our kids can walk to K-12 (although adorably our kindergartener takes a bus for about three minutes on most days because she just just loves it). We can walk to the pool, library and Safeway easily. We walk or bike downtown (especially for the amazing 4th of July celebration). And we have a very short walk to the local brewery, distillery and a winery. Oh and the kid’s pediatrician. I’m also a runner and there’s lots of great routes from my front door. I frequently run to Manitou Beach and enjoy running along the water. North Town Woods also has a great sense of community. We have a neighborhood 4th of July Party, Chili Cookoff, Last day of School Party, etc. And Halloween in North Town Woods is not to be missed. We could not be more happy with where we live. We “internet stalked” a bunch of Realtors before contacting Jen when we were making our move. We both kept coming back to Jen’s amazing blog when we were trying to visualize what life would be like on the opposite coast. 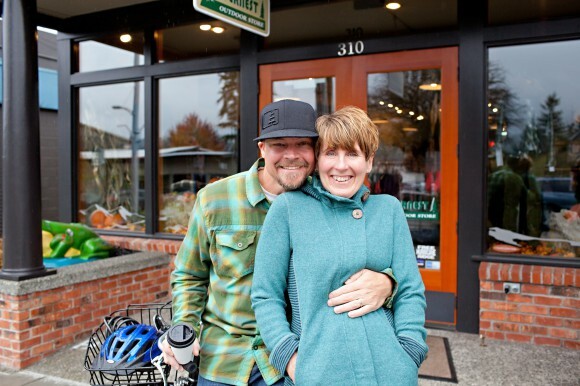 Jen’s love of Bainbridge is infectious and we are so glad we chose to work with her. She was knowledgeable about all the different neighborhoods and areas on Bainbridge . She was able to provide information about schools, pending houses, houses coming on the market, and life on different parts of the island which really helped us narrow down where we wanted to live. We have previously worked with some pretty amazing Realtors but Jen is the best of the best. She exceeded our expectations in every way possible. We are a family of four who loves the west coast. I am originally from British Columbia and as our oldest daughter was approaching kindergarden we decided that we wanted to be back on the “best coast” so we could do more of the things we love. 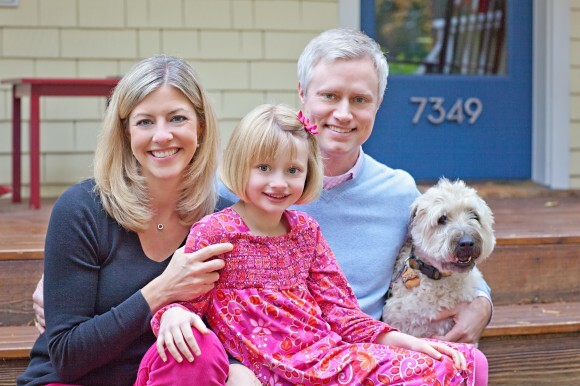 We moved to Bainbridge from DC’s Capitol Hill Neighborhood in the spring of 2013. We are both mechanical engineers. My husband commutes to Bangor and I telecommute. We enjoy being outside hiking, running, and (most of all) skiing. Our oldest daughter is a very proud Ordway Otter and our youngest daughter has a blast attending Bainbridge Island Child Care Center for preschool. My family and I love coming to Point White Pier to watch the sunset. We love to look for crabs under the rocks, starfish at low tide and sparkly pieces of sea glass. I walk this road almost daily and it has become my peace; my serenity. I love the smell of salt in the air, listening to the bald eagles and watching the playful otters just off the shore. I can’t imagine being anywhere else. We love living on the south end of the island because we love Lynwood Center and Blakely Elementary. The south end has such small town charm with a wonderful, one-room movie theater as well as a coffee shop and wine bar. 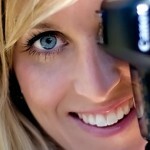 We chose Jen because we found her blog online and loved the information that she provided. She had amazing pictures and all the important things we wanted to know about moving from another state. Once we came to the island and met Jen in person, we quickly realized how lucky we were to find such a wonderful, trust-worthy and skilled Realtor. Jen worked hard for us. No detail was left out when it came to finding and buying our dream home. She even went to our house the day our new septic tank was put in and, after peering into the hole, realized they had put the wrong size tank in. We loved working with Jen! She’s a gem of a Realtor and a kind, smart and lovely person. Our family moved to the island from Texas in the summer of 2012. We wanted to simplify our lives and be closer to nature so that our three boys could grow up surrounded by the forest and the sea. Schools were also very important to us and the Bainbridge Island School District is one of the best in the state. We wanted a slower pace of life and the island is just that. We also love how healthy the island is with a farm to table opportunity at almost every restaurant. We’re never leaving. We chose to live in Winslow for a bunch of reasons. We wanted to live in a part of Bainbridge that allowed us to park our car for weeks at a time and not have to drive everywhere. We can walk to the grocery store in 5 minutes and walk to work in about 20. We have two stores in Winslow and I wanted to be far enough away that I wouldn’t be tempted to go into work on my days off, but still be close enough to get to town quickly if needed. We’re close to the High School so we can go watch a basketball game or lacrosse match or just go for a run on the track. We were referred to Jen by our friends who had worked with her to purchase a home a few months before. We meet with Jen at her office, she listened to us and got a feel for what we wanted in a new home. She had some great ideas and I think we found our place after looking at less than a dozen homes. I’ll be honest, showing houses to us was the easy part of Jen’s job. Jen’s expertise really became obvious AFTER we’d picked our home. She walked us through the entire process, answering all of our questions and late night phone calls. She is someone I would not hesitate to recommend. I am a tough judge of character and can have a difficult time trusting people, especially when it comes to something as significant as buying a home . Jen “passed my test” very quickly with her professional, direct, supportive, enthusiastic and genuinely kind and caring personality. I never once questioned her work ethic, or her level of investment in us. To this day I am confident that she is still that invested in us and that we can rely on her help with anything we might need. We moved to Bainbridge Island full time in the fall of 2012 from Port Townsend. We own and operate two stores in Winslow, Wildernest and The Gear Stash, where we’re all about getting people outside, active and into the beautiful outdoors of Bainbridge Island and beyond to the Olympic Peninsula. In our free time we enjoy hiking, travel, playing golf and spending time with friends. We love and are blessed to be a part of the Bainbridge Island community. 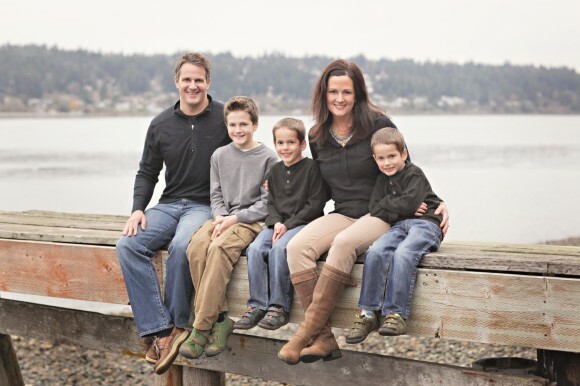 When we first decided to relocate to Bainbridge Island from West Seattle, our main priorities were great schools for our young daughter and a great community to establish roots. We also knew we wanted a sunny location for our home, so we focused our efforts initially on the south end of the island. Jen knew what we wanted from day one and kept sight of that, even when that meant taking us to other parts of the island, like Rolling Bay near the community farms. Jen showed us several homes – all with the sunny openness that we were looking for – but when we saw this property in a convenient yet off-the-beaten-path location, we fell in love. It had everything we were looking for: open space and plenty of yard for the husband and his riding lawn mower; close to a great elementary school; convenient access to the main highway; and it even came with chickens! And of course, it provided bright, cheerful light – just like we wanted. We did what anyone does these days when searching for information on something: we consulted Google. In our initial search for “Bainbridge Island homes for sale” Jen’s name immediately popped up. Right away, we loved her blog and all of the information she provided. It felt like we were getting insider knowledge from an old friend. We sent her an email then and there, and she got back to us right away. She remained by our side from then on. She was always there to listen, provide input, and sometimes talk us off the ledge (at the same time we were buying on Bainbridge, we were selling in Seattle, with a 4-year-old in tow…). We couldn’t have asked for a better experience than what Jen provided us, and that “old friend” we found on her website has become just that. 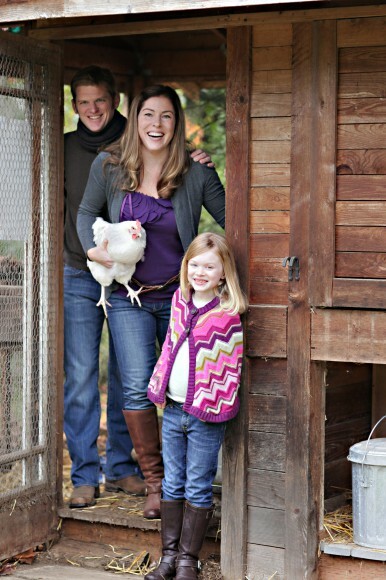 We relocated to Bainbridge Island in September of 2011 from West Seattle. We wanted to get settled in before our daughter started school and we knew that the community of the small island was right for us. 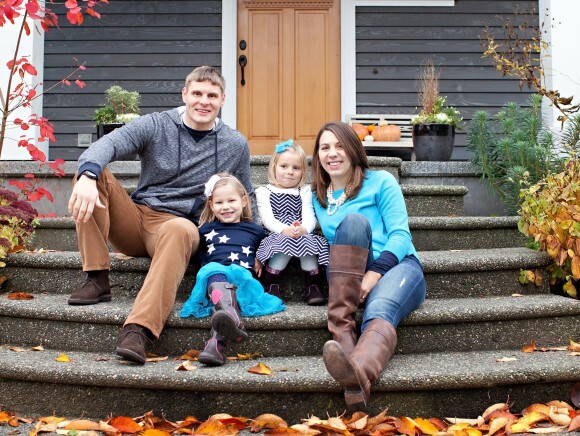 We both grew up in the Pacific Northwest, we have family here, and we wanted our daughter to be able to experience the joys of what a close-knit community can offer. As graphic designers who work from home, we have the flexibility to take part in our daughter’s school and extracurricular activities, but also know that Seattle is just a short ferry ride away when we need to go into the city. We have loved getting to know our fellow island residents; getting involved in our community; and being a part of the joyful place that is Bainbridge Island. The beautiful family portraits of my clients on this page and the main page were taken for my website by the lovely and talented local photographer Katie Brase. She took my headshots too!